With the annual Festival of Speed now over for another year, Goodwood is reflecting on a fabulous weekend that attracted a credit crunch-defying 152,000+ motor sport fans – the second highest Festival attendance ever – as well as over 120 star racing drivers and riders. These included reigning World Champions Lewis Hamilton (F1) and Sebastien Loeb (WRC), as well as the current F1 World Championship leader Jenson Button. Below is a snap shot of just a few of the highlights from a very memorable weekend at Goodwood. 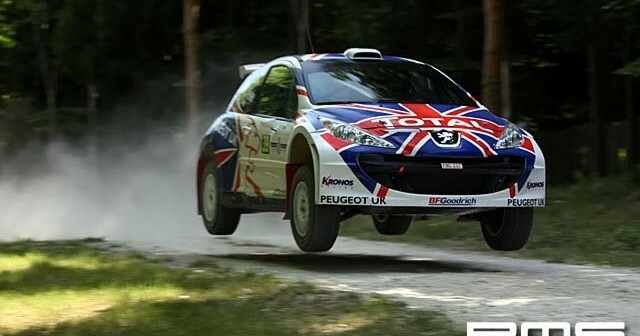 Forest Rally Stage: Five-time World Rally Champion Sebastien Loeb was on stellar form in his Citroen C4 WRC. Despite never having seen the Goodwood course prior to his maiden run, he flung his C4 around with abandon and instantly established a benchmark time considerably faster than the next man. His team mate Dani Sordo also put in a blistering performance on the stage on Sunday, as did legendary rally drivers Walter Rohrl, Stig Blomqvist, Rauno Aaltonen, Hannu Mikkola and Bjorn Waldegard throughout the weekend. Anniversaries: Audi celebrated its 100th anniversary in great style at the Festival, with a jaw-dropping ‘central feature’ display outside of Goodwood House, a popular exhibition site, and a mouth-watering selection of historic Audi racing cars, including Auto Unions, quattros and R10 and R15 Le Mans racers. The centenary of both Bugatti and Morgan were marked by Goodwood too with some truly desirable cars. The 75th anniversary of the German Silver Arrow racers saw a record gathering of 14 examples from Auto Union and Mercedes-Benz, and a paddock row filled with 14 Porsche 917s (40 years after its introduction) proved to be a highly popular site. Fifty years of the Mini was also honoured with various examples of the Issigonis classic at the Festival. Americana: American entertainment legends Jay Leno and Peter Fonda were a big hit with the Festival crowds, Fonda riding his famous ‘Captain America’ chopper from the influential movie Easy Rider up the Goodwood Hill throughout the Festival weekend. Cult US television presenter Jesse James also delighted the fans with his crazy exploits on his menacing 950bhp Baja-style ‘Trophy Truck. Equally alien to European sensitivities, the mighty NASCAR stock car racers went down a storm. Cartier ‘Style et Luxe’: Judging was frantic in this annual automotive design concours, with Will Young, Jasmin Le Bon, James Martin and many other star judges finally declaring the stunning 1934 Hispano-Suiza H6C Xenia the Best of Show against some very stiff competition. On Festival Sunday, the Cartier Lawn had the added attraction of ‘The Magnificent Seven’, a collection of desirable Ferraris owned by presenter Chris Evans, with six of the seven resprayed in dazzling white to help raise funds for the BBC Children In Need charity. 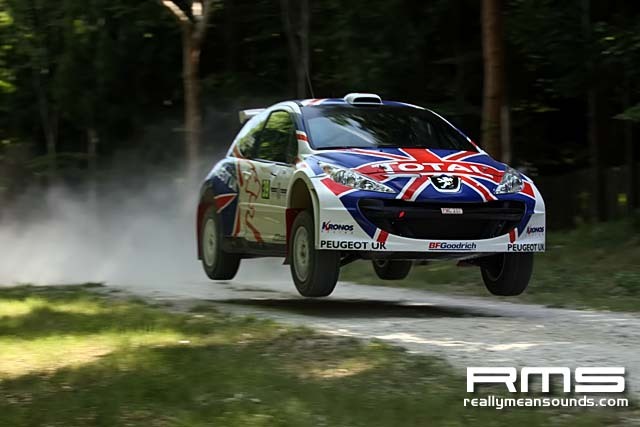 Timed Run Shoot Out: For the first time in many years, Sunday afternoon saw the fastest timed cars up the 1.16-mile Goodwood hillclimb shoot it out against the clock in an exciting timed run. Festival stalwart Justin Law aced the course to take the Fastest Time of the Day award aboard a Jaguar XJR-12 in an astonishing 44.40-seconds. Other attractions over the Festival weekend including a run of the very latest supercars and interesting low-emission vehicles, spectacular air displays by the Eurofighter Typhoon and Red Arrows, some stunning bike runs by many top motorcycle riders, a record-breaking Porsche 48-hour human endurance run, stacks of new model debuts in FoS-TECH and the exhibition stands, the Wacky Races and Junior Festival of Speed, plus hundreds of important historic racing cars and drivers. All-in-all, the competitors and spectators agreed, the 2009 Festival of Speed was a truly wonderful weekend of entertainment. With so much to see and do, the spectator feedback suggested that this was the best of the 17 Festival of Speed events to date. Lord March and his team are already hard at work planning the 2010 Festival, although before that they have the 2009 Goodwood Revival to keep them busy, which takes place this year from 18-20 September.